Speranza has the luxury of being able to keep unadoptable dogs, as well as our rescue farm animals, for the duration of their natural lives. We rely on several volunteers to help us safely provide these sanctuary dogs and farm animals with a positive quality of life. We currently have four dogs at Speranza that will never be adoptable, even with rehabilitation. These dogs will live out their lives at the Speranza farm where we know we can keep them safe and out of trouble. Our farm animals - pigs, goats, cows and cats - well, let’s just say they’re living the good life! Hugo is one of the most recognizable dogs at Speranza. His gentle demeanor and love of everyone he meets makes him a huge hit with visitors and volunteers alike. So why is Hugo not adoptable? Hugo has separation anxiety like nothing we have ever experienced before. He has been adopted three times to the most perfect families, but Hugo does not tolerate being left alone, even for 30 minutes. He can be extremely destructive and gets very depressed when left alone. Rumor has it his family of six years never figured out he is deaf, and they beat him because he wouldn't listen. Hugo has only experienced love, affection and stability since coming to Speranza and his previous life in a “home” was abusive. No wonder he wants to stay at the rescue! Our sweet Lola, who is also deaf, came to us from a high-kill shelter. Lola is an older gal who is pretty set in her ways. She can be moody; some days she doesn’t want anyone to touch her or come close to her. Fortunately the way our facility is set up, she can run out into a play yard without us touching her if that’s what she needs. Lola loves to go for walks and explore, but she absolutely cannot go in cars without a proper transport crate. She takes possession of the car and won’t come out or let you in. Oscar has been at Speranza for about 4 years now. He was found as a stray and once he arrived here we soon realized that he had certain triggers. Soon after he came he inflicted a serious bite to Janine’s face – however, it was a ‘bite and release' and we understand what triggered him. Oscar can be walked by volunteers as we now understand his issues and he can safely be handled by all. Johnny Joe came to Speranza in October of 2017 after living 6 or 7 years on a heavy chain in someone’s front lawn. He was never socialized and is only handled by about 6 volunteers. He has a small social circle and that seems to be how he likes it. He will take treats nicely through the kennel door from other volunteers, but because of some concerning behavior on his part in the past, he will not be making new friends any time soon. Johnny Joe is living a life of comfort for the first time in his life and seems to be loving every day at Speranza. 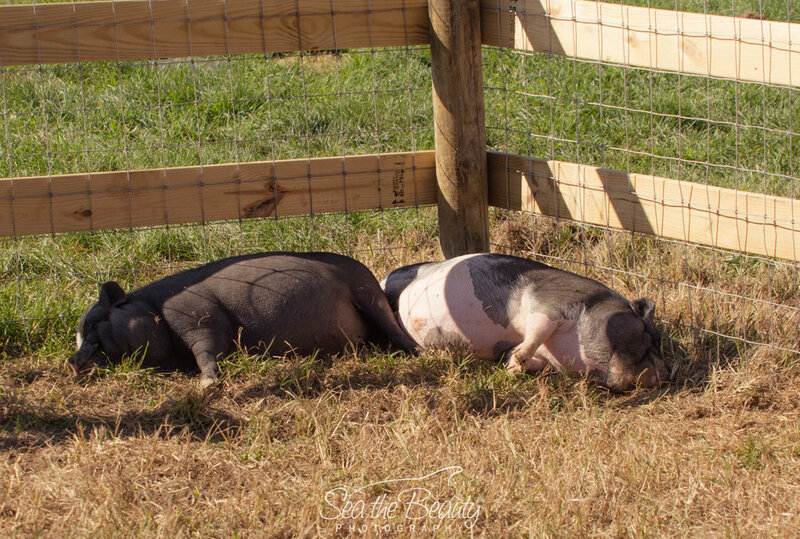 Speranza Animal Rescue is currently the home to eight pigs, one hog and a seven pot-bellies. The three smaller pigs, Pumba, Piggy Smalls and Elvis Pigsley, live together and the 5 others live together. Hamlet is large and in charge! He is HUGE and still growing. He was the runt of his litter and his littermates were picking on him. They bit off part of his ear and he was brought to Speranza before it could go any farther. He is a pig raised among dogs, so he has some dog-like tendencies and provides never ending entertainment. Hatfield was found as a stray in Philadelphia, PA and was taken to a local shelter before finding his way to the Speranza farm. He is an older pig. 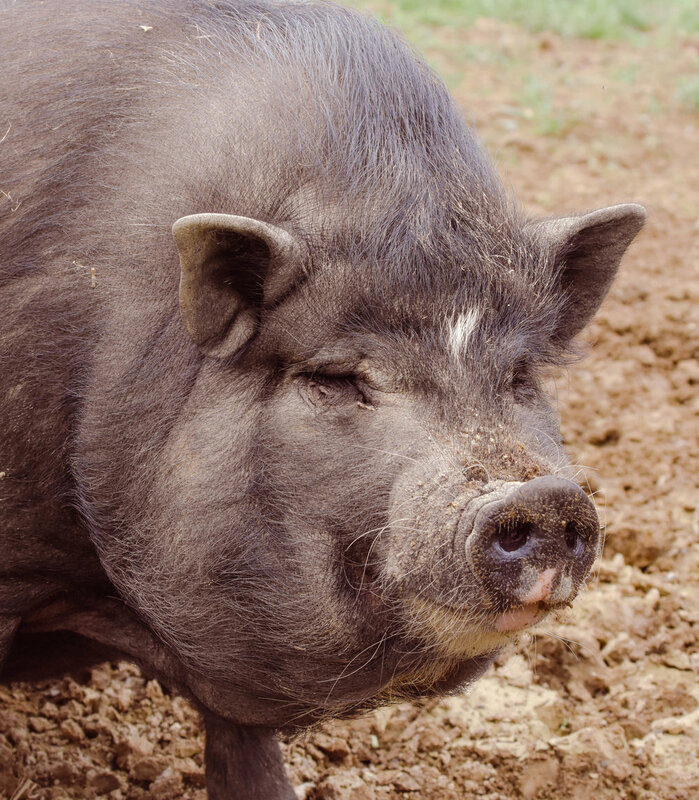 Porkchop was found wandering as a stray in the woods Dillsburg, PA and was Janine’s first pig wrangling experience. The vet thinks Porkchop is an older pig. Miss Piggy was an owner surrender. She absolutely loves belly rubs and is the reigning Queen, as the only female pig on the farm. Notorious P.I.G. was literally running loose along Interstate 83 for a few days before we could catch him. Janine laid in the bushes and waited for him to run by and she grabbed his foot and then leashed him. Pumba ended up in a local shelter and made his way to Speranza shortly thereafter. He is vocal and lives with Elvis Pigsley and Piggy Smalls. Jiminy Cricket and Gepetto were bred by a goat breeder. Three goats were born and sadly one died. The mother then abandoned Jiminy Cricket and Gepetto. Our awesome volunteers shared custody of the days-old baby goats (in their homes) and bottle fed them around the clock until they were old enough to move to the farm. These fun loving cuties love to run and play and even walk on leash sometimes! Figaro came to Speranza in December 2018 when his family could no longer provide for him as well as they would like. He immediately settled in with his new brothers and hasn’t stopped dancing around since. He is our smallest goat and couldn’t be any cuter! Urkel was born premature and his mother would not feed him. He was brought to Speranza as a sickly 3-week-old lamb who was hospitalized for several days. Once he was healthy enough to leave the veterinary hospital he went home with one of our volunteers and was bottle fed until he grew strong enough to come to the farm. He has tons of personality and loves attention. Meatball came to Speranza very sick and the vet didn’t think he’d make it through the first few days. Janine bottle fed him back to health and he has been grazing the farm since. Mr. Beans meeting his big brother, Meatball. Mr. Beans is our smallest cow. He came to Speranza as a sickly young calf in October 2017. He lives in the pasture with the three big cows and we call them all “The Cowboys.” Mr. Beans is notoriously mischievous and is routinely loose on the farm grazing and getting his craved attention. Crabcake is the reigning Queen of the farm. She has been here for years and is always near by. Crabcake loves to find a cozy spot to curl up and nap or just watch all the activities from up in the barn rafters. Leo came to Speranza when he was less than a year old with his brother Bambino, when a local farmer surrendered his goat. The trailer opened, out came a goat and two kittens. Because the farmer was losing his farm we agreed to keep the two cats. Bambino went home with one of our volunteers and Leo is the most social cat you’ve ever met. He loves stowing away in volunteer cars and taunting the dogs. Herman first showed up at the farm years ago, but is rarely seen during the day. Herman roams the farm but tends to stick around Janine’s parents house. He absolutely loves back scratches. Simon has belonged to Janine’s mom for more than 18 years and is the patriarch of the animals at the farm. He is a gentle old man who has Cushing's Disease and requires daily grooming, medication and regulated pasture time. He has had a great life and is very loved. Dave was a work horse on an Amish farm for 11 years. He got harness shy and had an injured leg and was going to be sent to an auction. He was not trusting of humans and would flinch when you attempted to pet him or give him treats. Over the months he has put on some much needed weight and now looks forward to treats. He is still shy but he is really coming out of his shell and starting to trust. Loretta Lou is a 16 year-old Mule and was also to be sent to an auction at the same time that Dave came to Speranza. Janine wanted Dave to have a friend and wanted to save Loretta for a grim fate - and it worked perfectly - these two scared, untrusting animals have become best friends. Loretta is also learning to trust more and more as time goes on. Janine was notified about a young male donkey that needed a home in October of 2018. She excitedly agreed to take him, and was told that his mother was being taken by another rescue. Colonel Sanders and his mother, Mary Poppins, were very bonded and both cried and cried for days after being separated. About a week after bringing Colonel Sanders to the farm Janine found out that the other rescue bailed on Mary Poppins and for the first time she was all alone and crying constantly. Do we even need to tell you what happened next? The most adorable reunion we’d ever seen. The Dodo even came out to make a video about these two. They are now living happily at Speranza and they’ll never have to be away from each other again. Click here to watch the link to the Dodo video. Wendy and Tinkerbell are a bonded pair of miniature horses. They both lived a life of neglect before coming to Speranza in October of 2018. Wendy is about 8 years-old and came to us in pretty good shape, compared to 14 year-old Tinkerbell, who’s hooves are terribly deformed from years of neglect. A farrier is coming often and is optimistic that with time and continuous care her feet will get better. She is already a lot more mobile that she was when she came. 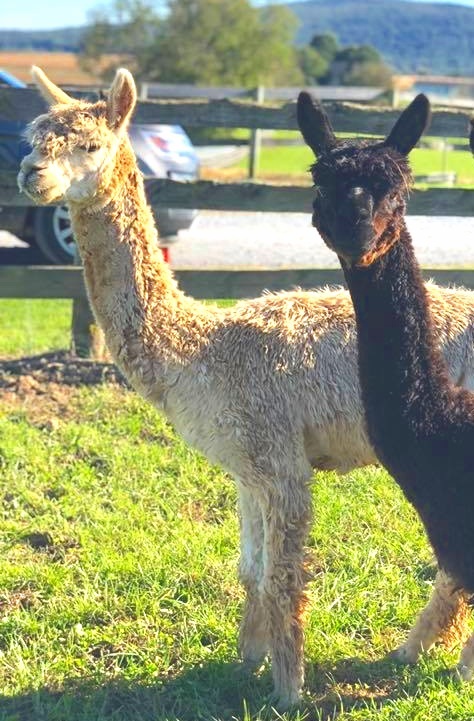 These two enjoy time in the pasture with Urkel and Cadbury. Clara Bell and Fernando lived at a farm where they were no longer wanted and had not been well taken care of. Both were skinny and losing their coats, but have since gained weight and are getting healthier every day. Clara Bell is actually pregnant so our herd will be growing by one soon! We are working on socializing these two, as they were not handled much previously and are both scared of humans at this point. We believe that they are both 3 - 5 years-old.